same as for Jade, Here we use 2 white-space as indentation for Jade expressions to nest them into one another. which will produce filename.js containing the compiled template. => Using doctype as an Option while compiling and rendering, and see its effect. The doctype affects compilation in some other cases, for example self closing tags and boolean attributes). For this reason, you might sometimes want to specify it manually. You can do this via the doctype option. e.g. placed on their own line. => Piped Text, prefix the line with | character. | because This piped text will be passed as it was. <body>Plain text can include <strong>HTML</strong><br/>because This piped text will be passed as it was. Often you might want large blocks of text within a tag. A good example is with inline scripts or styles. By default, text at the start of a line (or after only white space) represents an HTML tag. Indented tags are nested, creating the tree like structure of html. => Jade also knows which elements are self closing with the help of DOCTYPE declaration. : to nest one or more HTML elements. ). To save space, jade provides an inline syntax for nested tags. Tags such as img, meta, link and so on are automatically self-closing (unless you use the xml doctype). You can also explicitly self close a tag by simply a[[ending the / character. Only do this if you know what you are doing. parenthesis, and If you have multiple attributes than separate them using comma. => If you have many attributes, you can also spread them across many lines, and there is no need to use comma to separate them. By default, all attributes are escaped (replacing special characters with escape sequences) to prevent attacks such as cross site scripting. When no value is specified, true is assumed. The class attributes can ba a string, but it can be an array of class names, which is handy when generated from Java-script. => Class Literal, ( easy and Simple way to define classes for any HTML element), If no HTML element is used with .class than a DIV is assumed. => ID Literal, (simple and easy way to define ID for HTML elements), If no HTML element is used with #ID than DIV is assumed. Cross Site Scripting. This is done for you if you passing in attributes from a mixin call. Both plain-text and piped-text support interpolation. The extends keyword allows a template to extend a layout or parent template. It can then override certain pre-defined blocks of content. //- you can extend this into another template. 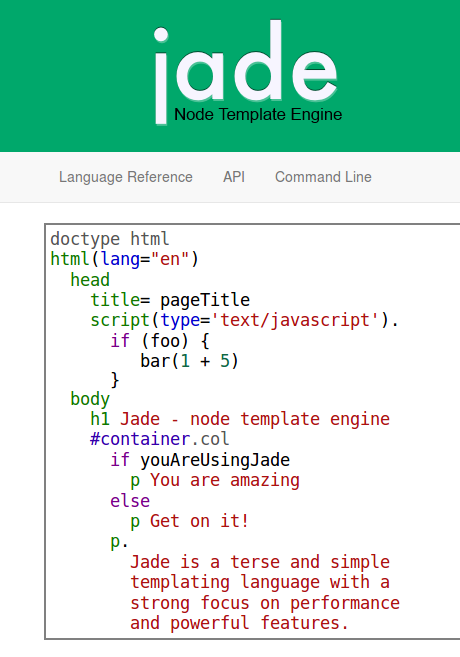 Filters let you use other languages (like, HTML, XML,,,) within a jade template. They take a block of plain text as an input. => Includes allow you to insert the content of one jade file into another. In order to apply the transform markdown you must install one of "marked","supermarked","markdown-js","markdown"
Now we do not want to use the defaul content of blocks scripts and content, so lets re-define them. This is possible to override a block to provide additional blocks. Here we are extending layout.jade but we are re-defining the content block. "head" block that you wish to utilize on every page and there are also some custom scripts that might be diffrent for a diffrent web pages. This is why, you don't want to replace the default content of scripts block, This is where 'append' can help you.